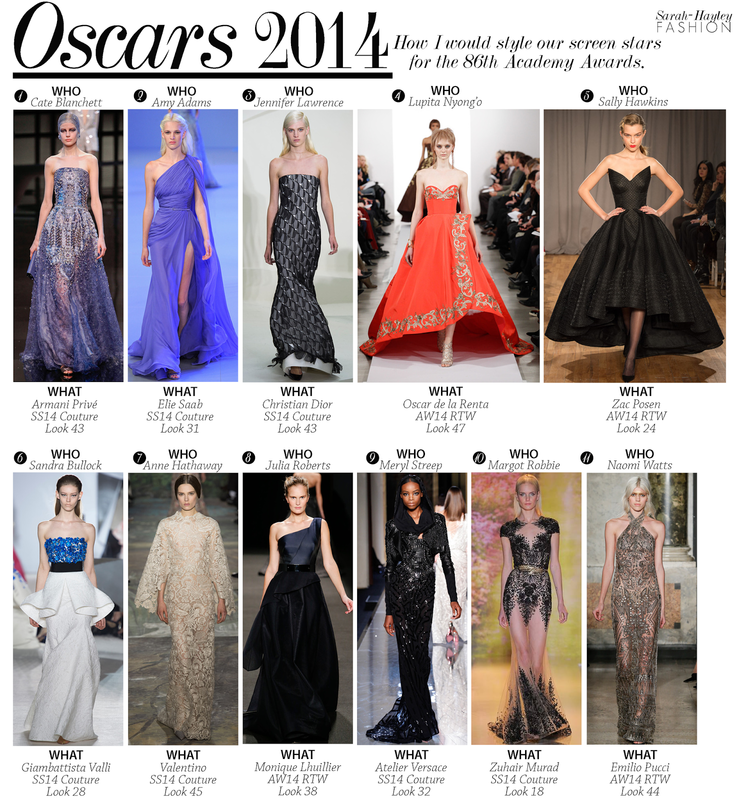 How I would style our leading ladies for the Oscars 2014. As a stylist I regularly style my clients for red carpet events. For those who are unfamiliar with the process, I have explained briefly what happens a month before the red carpet on my tumblr. The process I go through in comparison to the preparation for the Oscars is significantly less. This is the biggest red carpet moment of the year and the pressure is tenfold for both actress and stylist, in particular for the nominees. Not only do they need to look incredible but they need to please a whole host of individuals. Gowns will not be chosen until the last minute, which is why it is difficult to predict what designer a screen star will wear. Therefore instead of predicting what I think they will wear, I have opted for the gowns I would like them to wear. The only difficult option was for Lupita as I am tempted to see her in a print for the first time instead of block colour, however she works an overall colour so flawlessly I think it's right for her to stick to what works.